I am not going to leave my link in this weeks TWD-"Leave your Link"-section because I made a catch-up. I missed the cookies Jasmine of Jasmine Cuisine picked two weeks ago. But I adore peanut butter (and anything peanut in general) so it was no question I am going to catch up with those one day. Additionally, I do not really like coffee-taste. Funnily, very often when coffee-including recipes are scheduled for TWD I nevertheless decide to follow them - and often they turn out great. Two weeks ago I missed the Crisscrosses because I was in Paris (no misery, I know). And this week I was a bit in a hurry, because a close friend stopped by for the week, so there was no chance I am going to do both, the cookies and the Coffee Break Muffins Rhiani of Chocoholic Anonymous picked this week. You can find the recipe on her page or in Dorie's book on page 15. And you can follow all the honest TWD'ers who made the right recipe for this week. I got to say that I was as sorry two weeks ago not to bake along with Jasmine, as I am this week for not going down the road with Rhiani. Both are incredible bakers and have wonderful homepages! Additionally, Jasmine is one of the few European participants and I am always surprised they often chose recipes with very typical american ingredients, just like peanut butter. Strange, isn't it? Well. The crisscrosses turned out just as expected. Incredible. In-cre-dible! Peanuts. Butter. Peanutbutter. Perfect. 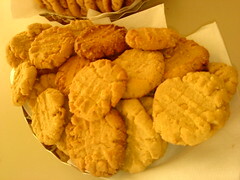 The recipe gives a whole lot od cookies, about 40-50. 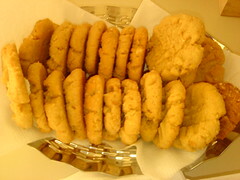 My colleagues really loved them, and nevertheless there were some left in the evening. 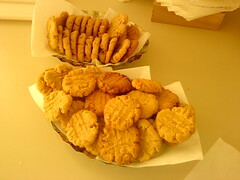 But be sure, it was not the falt of the cookies, but of the quantity.